Pandan plant (Pandanus amaryllifolius) (Chinese Name : 班兰) is a tropical plant native to South East Asia. It’s a perennial evergreen tree with fragrantly-scented leaves, growing into a small shrub 1 – 1.6 m tall when the leaves are harvested often, or a small tree 2 – 4.5 m tall in it’s tropical native habitat. Picking the leaves prevents it from growing into a tree form and keeps it small. The plant eventually forms an upright trunk, with a canopy of long, strappy leaves with thick aerial roots hanging down from the trunk. Pandan leaves are used in South-East Asian cuisine to wrap chicken, pork, fish and glutinous rice before they are barbecued or steamed to impart the distinct and unique flavour, which is described as being a milky-sweet, floral-rose-almond-vanilla-like.The fresh or frozen leaves need to be be bruised or boiled to release their flavour, and dried pandan leaves are described as having little to no flavour at all. In soups and stews, the leaves are tied in a knot and placed in the food as it’s cooking to give flavour and fragrance. In many dishes the leaves are cut into large pieces and cooked with the food, then removed afterwards, as they are fibrous and inedible. Pandan leaf is also used to flavour curries in Balinese, Malaysian, Sri Lankan and Thai cooking. Fresh leaves are also used in cakes and other desserts, confectioneries (such as agar jellies) and drinks. The fresh leaves are crushed or boiled to extract the green chlorophyll pigments, which are used to colour foods bright green. Commercially produced pandan extract can also be purchased for the same purpose. This versatile plant is also used medicinally, infusions of the leaf are used as a calming sedative for restlessness, while infusions of pandan leaf in coconut oil are rubbed on the skin to treat rheumatism. The roots contain the compound 4-hydroxybenzoic acid which is a potential anti-diabetic drug. More than just culinary, pandan leaves have pest repellent properties too, they contain the compound 2-acetyl-1-pyrroline which is a repellant to the American cockroach (Periplaneta americana) and German cockroach (Blattella germanica). Being a tropical plant, pandan doesn’t like too much sun or wind, and is best grown in a protected, part-shade position. A position that gets direct morning sun and a bit of dappled midday sun is ideal, but keep it away from hot afternoon sun! 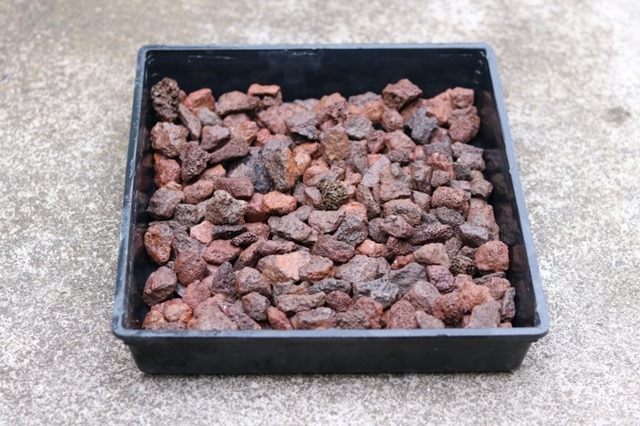 It’s also drought and frost tender, which means that the plant wont survive dry conditions or low temperatures, so keep the soil moist during the warm seasons and protect it from the cold. In fact, if the temperature falls below 10 C°(50 F°), the plant is best moved indoors for protection in cooler climates, as the plant is damaged by temperatures of 7 C°(44.6 F°) and below. In its natural environment, pandan prefers light well drained, moderately fertile soils. 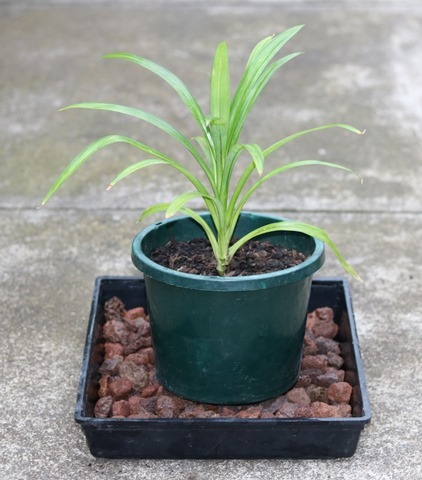 In cooler climates, grow pandan in a pot with a good quality potting mix. Temperate Climate Warm Season: Since tropical plants grow in climates which have hot, wet, humid summers and drier cool seasons, ensure that the pandan plant is kept moist (but not wet) during hot weather periods. Do not sit the plant pot in a saucer of water, that will rot out the roots. You can use a spray bottle to mist the leaves on hot days to maintain humidity around the plant, or sit the plant on a humidity tray (see below) to maintain humidity around the plant. Having other plants around the pandan will also provide protection from winds and increase the humidity levels. Locate the plant on the east side of the house where it will mainly get morning sun, use shade-cloth (50% screening grade) to reduce the effects of sun and wind when the plant is in a more exposed location. Temperate Climate Cool Season: When the weather begins to cool down, it’s important to reduce the amount of water, keep the soil just moist, as tropical plants dislike wet soil in cold weather. When overnight temperatures fall to 10 C°(50 F°) or below, bring the plant indoors. When day and night temperatures remain cold, keep the plant indoors until the weather warms up again. Make sure that the plant pot is placed in a location which receives good light during the day, don’t place it too close to the window, as it’s colder near the glass in winter, especially at night! 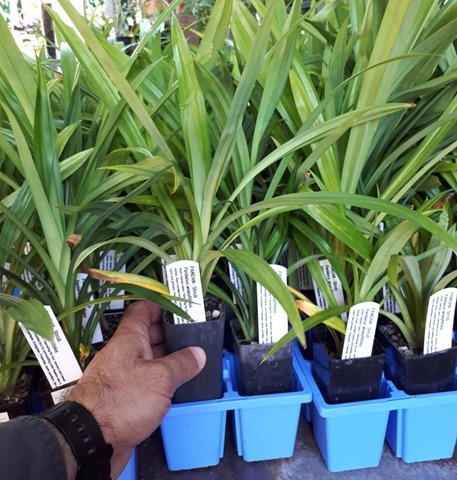 It’s important to choose the right indoor location for growing pandan, most houses have heating systems, such as ducted heating, which blows hot, dry air – this will provide the warmth but dry out and kill a pandan plant. Either choose a room with good light and no heating duct, such as a laundry perhaps, or use a humidity tray to keep the humidity levels high around the plant. Once again, you can use a spray bottle to lightly mist the plant leaves to maintain humidity levels around the plant, or sit the plant on a humidity tray to maintain humidity around the plant. 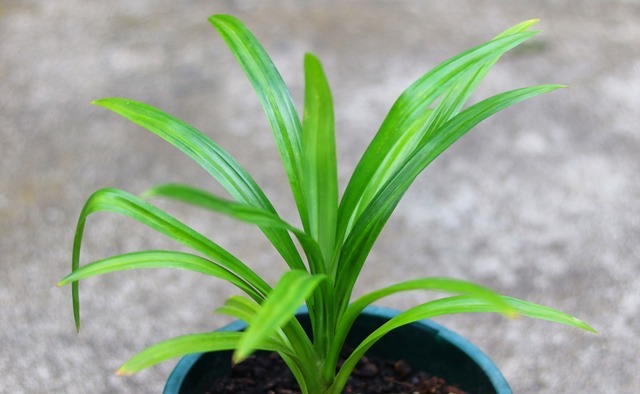 If the pandan plant is kept in a cold room, don’t wet the leaves as water will sit in the spaces between the leaves and the stem, become cold water and rot the stem. 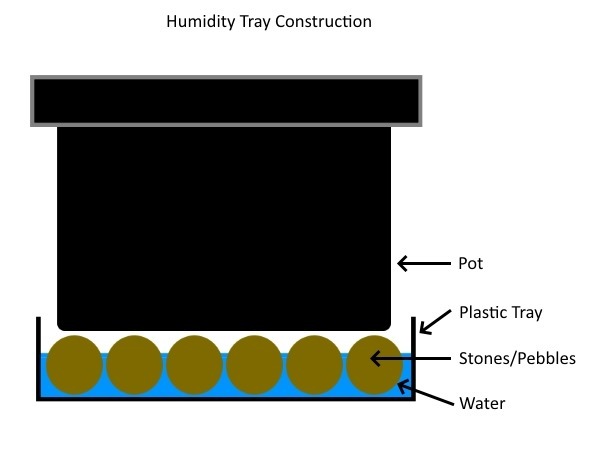 Constructing a humidity tray is very simple, just take a plastic tray which can hold water, fill it with stones or pebbles, then add water below the level the top of the stones or pebbles, so that a plant pot sitting on the surface is kept out of the water below. 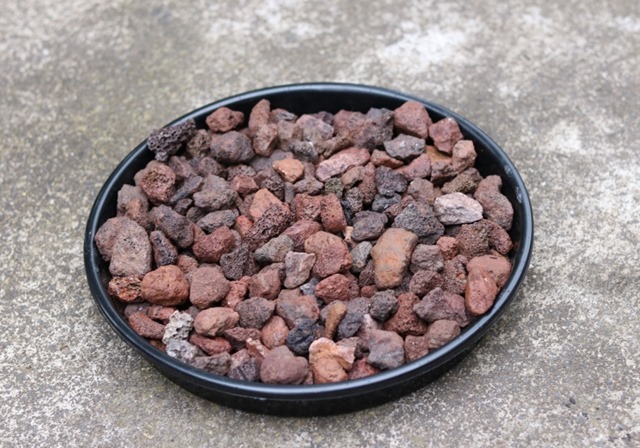 Water evaporating from the wet stones will increase the humidity around the plant, it’s that simple! Larger plastic trays can hold much more plants, and aggregating a number of plants together helps retain the humidity around them. Here’s a pandan potted up and sitting on a humidity tray. This can be placed near a well-lit window indoors, and an occasional topping up of the water is all that’s required. A regular misting would also help in heated areas with warm dry air, just keep the plant away from the heating ducts and the flow of air coming from them. To create even more humidity around the plant, use a clear plastic storage tub, place the humidity tray and the plant inside it, the surrounding walls of the container will retain a lot more humidity around the plant. For those who want to go a step further, it’s possible to raise the temperature a bit more too! An electric heat mat for raising plants seedlings can be used, just sit it under the humidity tray, it will warm the water, increase evaporation and create a nice warm humid microclimate for the pandan plant. National Parks Board, Singapore.Government, Flora & Fauna Web, Pandanus amaryllifolius Roxb. This entry was posted in Gardening Information, What's New! 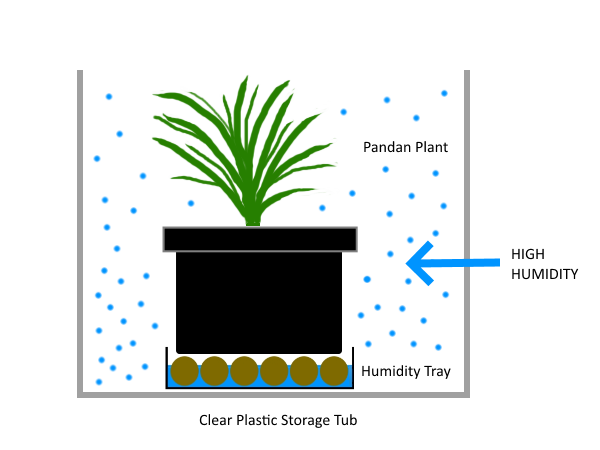 and tagged build a humidity tray, growing pandan in cold climates, growing pandan in Melbourne Australia, growing pandan in temperate climates, growing tropical plants in cold climates, humidity tray, pandan, pandanus, screw pine. Bookmark the permalink. Some of the old fashioned houseplants are related to it. I do not think I have seen pandan since I was still in school in 1990! Apparently in places like Singapore pandan grows as a wild plant along the sides of the road! Some places have the best ‘weeds’ lol! I noticed pandan growing wild (in pictures) on the northeast coast of Australia. To those who consider it to be a weed, it is just as bothersome as our weeds are to us; but that does not make their weeds any less enviable. The pandan plant used in Asian cooking and basket-making is Pandanus amaryllifolius, while our Australian native pandan here in Australia is a different species, it’s Pandanus tectorius, which produces edible fruit and seeds! A lot of interesting plants grow in the tropics!